An excavation carried out in August by the researchers of Universitat Autònoma de Barcelona’s (UAB) Department of Prehistory Vicente Lull, Cristina Huete, Rafael Micó y Roberto Risch have made evident the unique archaeological wealth of the La Almoloya site, in Pliego, Murcia. The site was the cradle of the “El Argar” civilisation, which resided in the south-eastern part of the Iberian Peninsula during the Bronze Age. La Almoloya resides on a steep plateau, one that dominated an extensive region. This both strategic and privileged position allowed over six centuries of occupation, from 2200 to 1550 before our common era. Emeterio Cuadrado and Juan de la Cierva discovered the site back in 1944. The findings indicate that La Almoloya functioned as a primary centre of politics and wealth within the political territory of El Argar- located a few hundred kilometres to the south in Almeria- and unveils new information on the politics and gender relations in one of the first urban societies of the West. The discoveries made by the archaeological team include an urban tissue made up of fully equipped buildings, along with dozens of tombs, most of which included grave goods. According to archaeologists, this urban tissue, as well as the solidity and mastery of the construction techniques, are unique samples of prehistoric constructions in continental Europe. The excavations demonstrate that the La Almoloya plateau, of 3,800 metres square, was densely populated and included several residential complexes of some 300 square metres, with eight to twelve rooms occupying each residence. The building’s walls were constructed with stones and argamasa, and covered with layers of mortar. Some parts contain stucco decorated with geometric and naturalistic motifs, a novelty which represents the discovery of an Argan artistic style. Among the discoveries made is a wide hall with high ceilings measuring 70 square metres, with a capacity for 64 people seated on the benches lining the walls. The hall contains a ceremonial fireplace and a podium of symbolic character. This unique building was used for political purposes and archaeologists think that it must have been used to celebrate hearings or government meetings. Archaeologists confirm that this is the first time a building specifically dedicated to governing purposes has been discovered in Western Europe, and are believe that decisions were made here which impacted many of the region’s other communities. The hall and adjoining rooms make up a large building, which the archaeologists have classified as a palace. They highlight the fact that only the most important Oriental civilisations had similar constructions during the Bronze Age, with comparable structures and functions. Of the fifty tombs excavated from under the La Almoloya buildings, one stands out in particular. Located in a privileged area, next to the main wall of the hall, the tomb exposes the remains of a man and a woman buried with their bodies in a flexed position and accompanied by thirty objects containing precious metals and semi-precious stones. One of the most exceptional pieces is a silver diadem that encircled the skull of the woman. 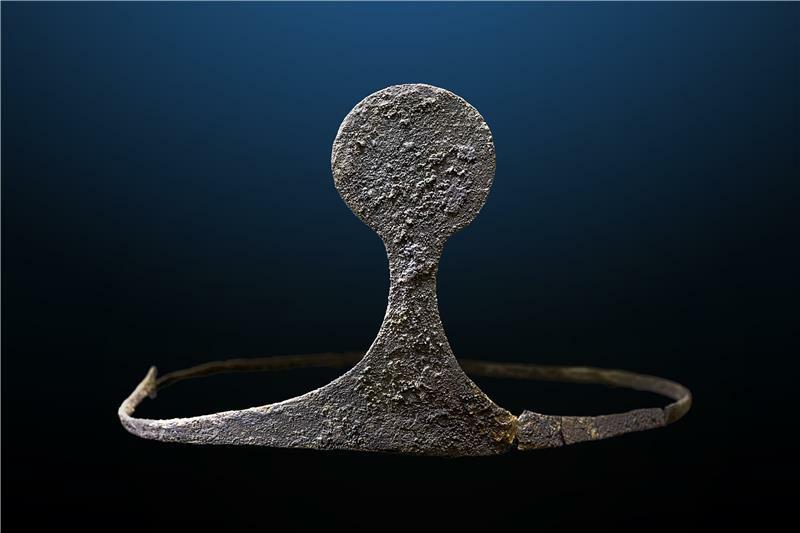 The silver diadem is of great scientific and patrimonial value, since the only other four diadems known to have existed were all discovered 130 years ago at the site of El Agar in Almeria, but none remain today in Spain. Four ear dilators, which are unusual objects for the Bronze Age, were also discovered; two are made up of solid gold and two of silver. The wealth of silver found at the site is especially notable, since archaeologists also discovered nine other objects made of silver, including rings, earrings and bracelets. They also discovered that the nails used to hold the handle of an elaborate bronze dagger were made of silver. One of the most admirable items is a small ceramic cup with the rim and outer part covered in fine layers of silver, which constitutes a pioneering example of silverwork on vessels. The last item worth mentioning is a metallic punch with bronze tip and a handle forged in silver. Archaeologists were in awe of the perfection with which the cup was crafted and the grooved designs which decorate the top of the punch. According to researchers, the artefacts discovered at La Almoloya are of great historical and patrimonial relevance. Their interest transcends local sale and should be considered of first order for all of Europe. They assure that the items are unique and that in addition to their intrinsic value, there is also the fact that they are perfectly contextualised. The archaeologists also stress the need to conserve, study and publicise these findings. La Almoloya contains many unknown answers and offers a vast amount of promising perspectives for future digs. The completion of the urban tissue and revealing the details of the first political structure of the West are some of the challenges remaining, archaeologists conclude. The team leading the archaeological dig at La Almoloya is led by Vicente Lull, Rafael Micó, Cristina Rihuete and Roberto Risch, professors at the Universitat Autònoma de Barcelona. The same team had previously made crucial discoveries at the La Bastida site, another dig site in Murcia from the Bronze Age. From 2008-2012 the team was also able to unveil a large fortification and several constructions discovered in the Argaric city. The digs carried out at La Almoloya received funding from the firm CEFU, SA, owner of the land on which the site is located, and from Universitat Autònoma de Barcelona. The Council of Education, Culture and Universities of the Region or Murcia also have offered support to the research.